Sea Ice News #13 | Watts Up With That? This summer we have had confirmation that Arctic ice behaviour has everything to do with wind. During June, winds were circulating clockwise in an inwards spiral, which caused ice extent to diminish and ice concentration to remain high. Around July 1, the patterns reversed and we have seen counterclockwise winds pushing ice away from the pole. As a result, ice area/extent has scarcely changed and instead we see a gradual decline in average ice thickness. The video below shows June/July ice movement and thickness. The graph below shows changes in ice thickness during summer over the last five years. Based on past behaviour, we can expect the average ice thickness to flatten sometime in the next two weeks. It should bottom out somewhere between 2006 and 2009. NSIDC has warned me that PIPS is not an accurate measure of ice thickness, though I would have to say it has done remarkably well as a predictor of this summer’s behavior. As you can see below, 2010 is following a track similar to 2006. As you can see below, we have reached the midpoint of the melt season in the high Arctic, and temperatures have been slightly below normal there for most of the last 55 days. There are only about 40 days left above freezing in the high Arctic. NCEP is forecasting below normal temperatures in most of the Arctic for the next two weeks. The sea ice graphs have nearly flatlined since the beginning of the month. DMI’s graph is particularly interesting, since it only measures higher concentration ice, which is less likely to melt through. Below is a closeup image showing that 2010 extent is now running close to 2006. The concentration and extent appears quite similar to 20 years ago. It has been cloudy in the Arctic and you can clearly see the counterclockwise circulation in the satellite IR image below. Clouds are white, ice is red. The webcams continue to show a little ice on the surface of the meltponds, indicating ongoing below freezing temperatures at the North Pole. We are at peak melt season, and there just isn’t much happening in the Arctic. The Arctic Oscillation has turned slightly positive in July, which tends to keep cold air contained in the Arctic and out of lower latitudes. The modified NSIDC map below shows ice loss (red) and ice gain (green) over the last week. There has been slightly more loss than gain. The modified NSIDC image below shows the difference between 2010 (green) and 2007 (red.) There is clearly more ice now than in 2007, and this is also shown in the NSIDC extent graph. Ice has flatlined in the North, while it goes through the roof in the south. In other words, the widely claimed polar meltdown continues to be nothing more than bad fiction. Meanwhile, USCGC Healy continues to ensure it’s ‘rotten’ in the vicinity of Barrow. The NERSC plots at arctic-roos are not flat, they show a marked increase in Artic sea ice extent, probably related with the 15% concentration threshold and how wind changes that. I love watching the play by play on this. BUT … I have to wait until late Augusts or September before I go off bloviating about how real science trumps political activism. Of course .. I’ll get the usual …. 3 years of data doesn’t make a trend!! .. LOL .. oh yeah it does .. it makes a three year trend. … a trend that .. btw .. has bucked the lack of wisdom held in the poltical activists. And what of Pips 2.0 ?? Pips shows a huge area, thinning RAPIDLY North of Russia’s Northmost Land & up to 87 degrees North. … ironically, in the 2007 Mega-Melt, this area held firm all year. It is Crucial because this is where the Gulf Stream delivers warm Water — in 2007, the 40 degree (F) water was separated by this ridge of Ice. We may get an Ocean Current Shutdown – – EVEN if the Ice total is not as low as 2007, because of the PLACES that melt off. – – they all show what may well be the European Diesel Craze (“Cash for Clunkers” in Germany is actualy: trading Gasoline for Diesel), eating away at the Ice, apparently by dropping Soot on it & turning it BLACK (or polka-dotted, actually). I know this is an unpopular view with the Politically Motivated. AGW is indeed REAL – – it’s just that most of the Bad effects are not from Capitalism, but the Global Warming Lobby trying to increase their $100 Billion a year Tax subsidy – – by making things worse. & Don’t forget Wayne Davidson’s theory that a quick Switch from El Nino to La Nina made 2007 so bad. But is it Switching ? ? >> The Ice drift in the Arctic, so recently almost nothing, is now Counter-clockwise and Strengthening. As the Areas with the Least ice are toweards Novaya Zemlya & Svalbard – where melting has already reached 2007’s Minimum & GONE PAST, this would throw Ice into that hole, rather than the usual disposal down the East Shore of Greenland. Pips 2.0 : use link above to Current Page & switch to Displacement (in upper right) OR substitute “Displacement” for “Thickness” for dated link. … 2007 Drift seemed to be usually Strong but sometimes switched Direction ( ! ). New update means new estimate. 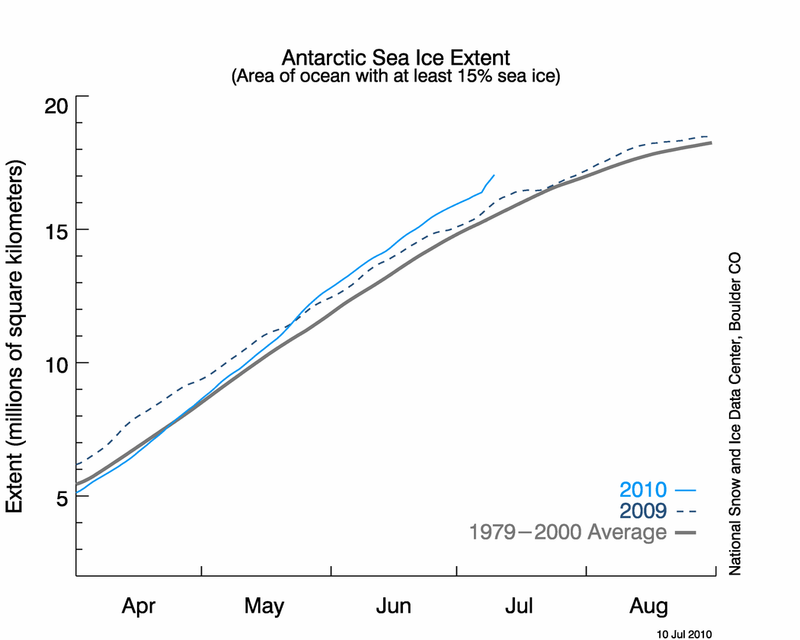 Sea ice extent (mean, 15% cutoff definition per JAXA/NSIDC) = 4.2E+6 km^2 (standard deviation = 0.45E+6 km^2). Previous estimate was 3.9E+6 km^2 (standard deviation = 0.51E+6 km^2). When I arrive in Sargents, CO. in Sept. I hope the Arctic ice is on your forecast and there is still a little snow along the continental divide this year which has been missing for about 3-4 years. This is based on my observation for about 20 years or so. I would feel much better about the climate if these minor things happened. I hope everyone bookmarks this quote of yours, or cuts and pastes it somewhere with the data of 7-11-2010. It should be forever connected with you, as it seems to be your deeply held belief. But if you want the Arctic weather, Steve does a great job. And speaking of weather, as I said in the last of Steve’s updates, look for big spike down later in July and into August in Arctic Sea ice, with particularily strong melt coming from the Atlantic side of the Arctic Basin. Or are you still just a bystander, not at all knowledgeable of the basic research being done. Looks like the ice melt is FLAT LINING!!!!!!!!! Ok I only believe what I read in the MSM….. Thank your for your work and for the information you present. R. Gates you seem to always leave out the effects of wind patterns. You said ” it seems you’ve carefully chosen your data to support your final conclusion:” That was the CRU. Yeah OK but look at the graph again and tell us what has happened since 2007? 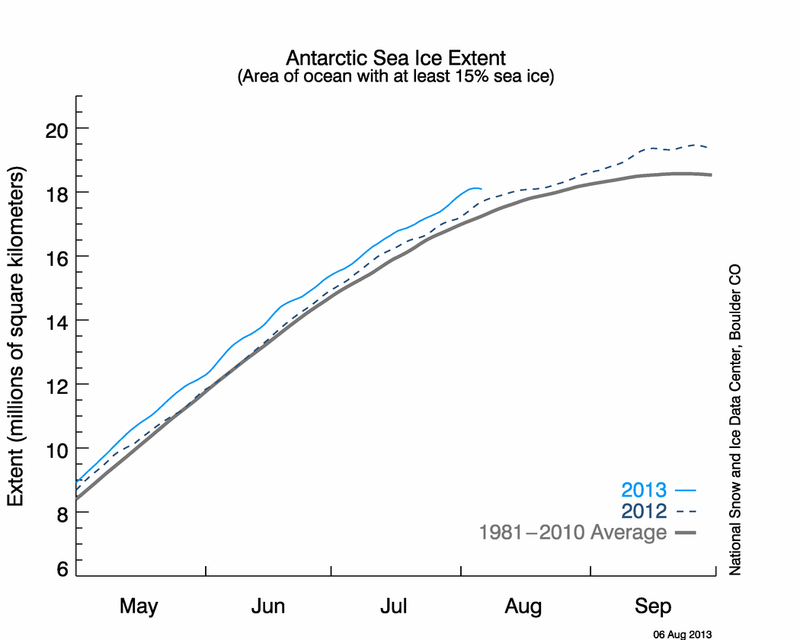 There seems to be an upward trend, therefore the sea ice is recovering, no need to panic………. Arctic basin ice free? = Not in your or my life time mate. Now I’m wondering if there’s no sensor problem again here (I mean in the last few days). The symmetry of the two signals (arctic/antarctic) seems to suggest it and moreover the JAXA index has no such “plateau” (see the widget to the right). Is there any way to verify this? Guess what, since the beginning of time, we have had ice melt and recovery, some less, some more. Its good that Steve continues to counter the ‘alarmist’ view, but really, ebb and flow each year. “[…]- – they all show what may well be the European Diesel Craze (“Cash for Clunkers” in Germany is actualy: trading Gasoline for Diesel), eating away at the Ice, apparently by dropping Soot on it & turning it BLACK (or polka-dotted, actually). No, the cash for clunkers programme in Germany paid 2500 Euro if you give up your old car and buy a new one, no matter which. We have always driven lots of Diesels because Diesel was taxed lower here; but in recent years the prize difference at the pump dropped and sometimes became zero so Diesel loses some of its attraction. Germany has introduced strict soot controls and Diesel cars need to have a particle filter; old ones need to be retrofitted to be allowed into some cities. All people i know that participated in the cash for clunkers programme bought a gasoline car. Our new favourite is LPG; it’s tax excempt because it produces less CO2 per mile. But the installation costs 2500 Euro so it’s only economical when your mileage is high enough, otherwise you never make a gain. Your information about Germany is wrong. Wherever you got it. Thanks Steven for another good report. ArcticROOS bear out your statements about what’s happening in the Arctic, and it looks like the recovery continues. Strange how all the global warming we’ve had over the last 15y (NOT) has had so little impact on total global sea ice levels. With the sun still in the doldrums, I think it likely that the recovery seen in 2008/9 is set to continue. I would say Goddard’s conclusions again match my own through my watching of pretty much all the same data with the exception of PIPS as I do not follow those data. 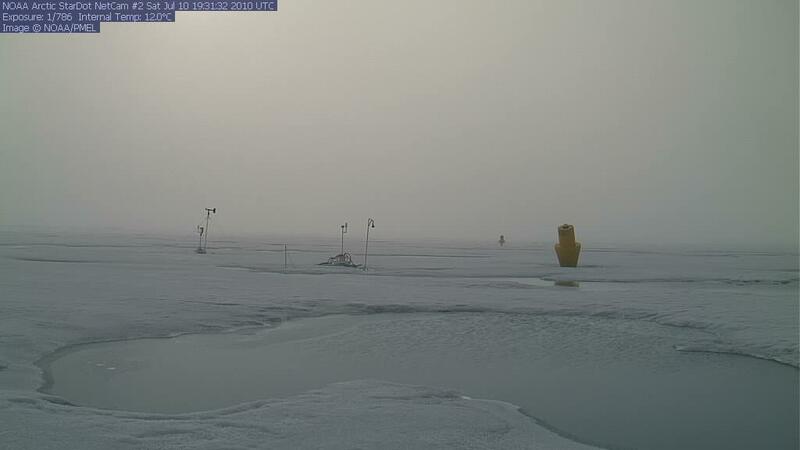 Continuing cloudy weather at the pole is likely to retard solar melting even in the presence of (despite the presence of?) soot/ash contaminated ice. Air temperatures are below normal so no unusual melting from that either. Winds seem so far to be behaving themselves and aren’t blowing large amounts of the floating arctic ice cap out into the Atlantic. In two weeks temperatures begin to fall in the Arctic and sun angle is no longer going to be a significant contributor to melt at high latitude. I notice there is no “Northwest Passage” chatter this year, nor is there likely to be barring some really unexpected weather event. It doesn’t look like we have had breakup at Point Barrow yet either. Nothing surprising in this report and everything looks on track. I would say the only difference between what I expect and what Steve Goddard expects is I expect the ice to be closer to 2006 than he does. Your graph starts at peak ice of the late 70’s cooling “scare”. I, for one, know you didn’t even try on this comment. Natural cycles can explain your graph. It’s the sound of the Climate Men workin’ on the Trend Gang. What part of the Continental Divide do you visit? I’ve hiked the CD in Summit County every summer for the past five years and see snow fields right up until the September snowfall begins to start the next season’s snowpack. I’ve seen permanent snow fields in other areas of the Rockies every summer. A friend of mine a few days ago skied a couloir with plenty of snow up near the CD. Meanwhile, it’s another cold and rainy day in Breckenridge. I’ve noticed the wildflowers are late in blooming this season. Not much warmth in Summit County this summer. Wind is the dominant factor in arctic ice ablation. Sun light would be the second most important. Temperatures don’t vary much in the summer. R. Gates says: “N-Icely done update Steve. Very thorough, and it seems you’ve carefully chosen your data to support your final conclusion…. “I hope everyone bookmarks this quote of yours, or cuts and pastes it somewhere with the data of 7-11-2010. It should be forever connected with you, as it seems to be your deeply held belief. Not one iota of which proves that any of this is caused by human activity. Get a life. Charles, maybe you got the impression that there is a Diesel craze in Germany because VW and Audi have started promoting their Diesel technology in the USA. But i can assure you that they have developed this technology continuously over the past 30 years, and also Ford – who has developers in Cologne AFAIK – sells a lot of Diesel-equipped cars here for a long time now. Every few years VW tries to break into the US market with their Turbo Diesel’s and usually they fail because it’s just not that attractive without extra tax incentives. So there’s nothing new here with the Diesel’s in Germany and surely no craze; i had a Diesel by VW from 1984 to 1994 and one by Ford from 2003 to 2008. Now i’m on Gasoline/LPG. Thanks for the link. Some test projects in Lower Saxony are underway, there’s some shale at the border to Holland. The companies keep a low profile and it didn’t hit the news big time yet. Got a bit ahead of ourselves, didn’t we…. I think the NSIDC needs to hire you to replace the fools they have now. Another nice article Steve. It will be intriguing to see where ice levels will be at the end of the summer. History suggests you should look at a much longer time scale than thirty years which will put the modern era into its proper context..
Link 1 Ice extent maximum- Depends if you are talking winter or summer but ‘decline’ starts around 1976/9 from a high point. Link 4 The concerns over ‘global cooling’ in the 70’s which caused the arctic ice peak did have some basis in fact. There were a series of low temperatures in many arctic areas during the 70’s which ice would have corresponded to by growing. Link 16 This from the late John Daly has numerous references to previous periods of arctic warming. If you want a conclusion not based upon data or anything else in the real world look to R. Gates. Yes, the SSM/I sensor is showing many spurious ice pixels for July 10, so for the time being we should not trust the NSIDC data. Since they take a five-day moving average, if the problem goes away we will need to wait until July 13 (Tuesday) for the average to “roll” past the bad data. Correction to previous post: We need to wait until July 16 (Friday) when the data for July 15 (Thursady) is available, assuming that the spurious pixels are gone beginning with the map of data for today which will be available tomorrow. On top of the flat-lining of the arctic ice smelt I notice that AMSU-A has also started to flat-line a bit. http://discover.itsc.uah.edu/amsutemps/execute.csh?amsutemps (near surface layer) is down to 0.53F and http://discover.itsc.uah.edu/amsutemps/execute.csh?amsutemps (sea surface) is up to 0.37F cooler than 9 July last year. 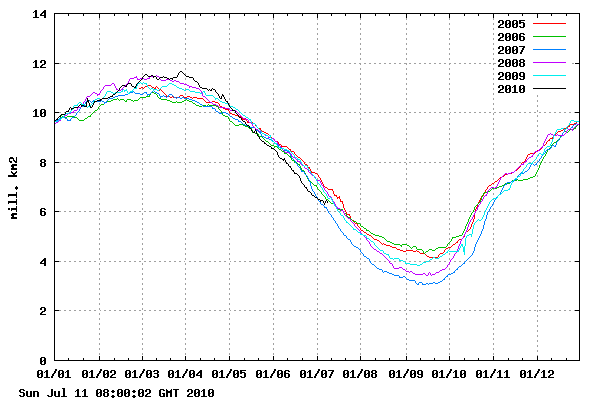 So it would appear that air temperatures are heading downwards and overall sea ice extent is average. Not much sign of a boiling/burning globe (as yet) here. Only a few more weeks of this theatre and someone will get a trophy. Ah, Gates. your stained-glass Window view of the world is heart-warming, at least. It stinks that the world cup ended without 22 players on the pitch. Congratulations to Spain though for finding the back of the net. Thanks, Steve and Tonyb, for such good reading material on a Sunday afternoon in Chicago! Now, all I need is my daily fix of Leif….maybe we can start talking about solar physics & the effect on polar ice? I’m sure he’d sniff that out! Later! Which should have precedence, predictions or reality. In Science, one may make as many predictions as desired, but what actually is going to happen should be respected more than the predictions themselves. Otherwise it becomes obvious, as in this statement by donald, that there is an emotional desire, divorced from objectivity, that is the driving force behind these predictions. Anthony many , many thanks for the excellent presentation of the facts , but our warmist friends will be good for a couple of unpleasant surprises , experiencing their new excuses for what went wrong with them . Have you ever thought how the russians could be blamed for all the extra ice that the arctic will start showing in a couple of weeks ? Is there maybe a change in the formation of new ice that the katlin expeditions have overseen ? What is the impact of the shrinking icebear population and the growing seal-population on the ice coverage ? Is the movement towards a neutral ph in sea-surface water leading to a more rapid ice -growth ? You may notice that any fool can come up with more questions than there are answers and some fools are capable to wiggle billions out of our society to write answers on these questions and to come up with more questions requiring even more billions to find answers even when reality does not behave like their models designed as perpeetum mobiles for money-laundering . At least the mob is honest about their objectives and the law is an opportunity to make money . Well is not it the case for AGW – supporters ? Is cap and trade based upon an implementation of new laws not working exactly the same way ? Who shall have the guts to put a charge against this club of approximately 50 fanatics for racketeering in grand style ? Anthony please keep at least the eyes of our children open for the facts and hopefully they will not be as stupid as a large chunk of our society . Yup, I am afraid that UK adjudicators, in all forms, appear to have lost the plot. Sadly (to put it mildly) appeasement has become the order of the day. And may I say Mr Goddard that your team is shaping up, defence organised and sound, midfield creative and combative, just have to wait awhile for the forwards to stand up and be counted! Regards and many thanks for the infotainment. It stinks that the world cup ended without 22 players on the pitch. i am slowly starting to understand your approach to things, Steven. you are in constant disagreement with everybody else, especially with facts and experts. anyone who saw the breast kick by Nigel de Jong at Xabi Alonso must be surprised that there were 22 players on the field that long. the referee was not perfect, but it was perfectly clear that he did everything in his power to NOT decide the game by a decision. So it seems that the total energy of the planet remains unchanged. North sea ice a bit low, south sea ice at a record, record colds in winter and non-heatwaves in summer in NH , cold waves in SH winter and no hot spots recorded during last SH summer. So, I would say that globally its getting a bit cooler, no matter what the politicians, journalists and money-making scientists say. R Gates: it wasn’t snowing in Florida. It was snowing all over the northern hemisphere. This winter we had the largest land snow cover ever between Nov and March. This winter, the sea ice cover at the SP is at an ALL TIME RECORD. Open your eyes and see the light, I mean the snow. And what of Pips 2.0 ?? Pips shows a huge area, thinning RAPIDLY North of Russia’s Northmost Land & up to 87 degrees North…. I wonder if that has anything to do with the Russian volcanoes heating up??? (soot & ash any one?) They were quiet the last time I checked a few weeks ago. Wise words. I wonder if any Warmists have considered them? Steve Goddard – the referee (English, bless him!) did his best to let football decide the outcome of the match. He’d have been vilified for ‘ruining the game’ if he’d reached for a red card during the first 90 minutes – damned if you do, damned if you don’t, I think. Why can’t I just be a good boy and believe everything that authority tells me? Now that the winds have shifted in the Arctic, your 5.5M km2 prediction is looking a bit conservative. Meanwhile, the first half of 2010 has seen a string of months with record high global temps. Yes, some of this is related to the El Nino, but the El Nino was not as strong as 1998, and we are not even close to a solar max. If we have a decent El Nino near the Solar Max of 2013, global record high temps will be shattered– and you can take that to the bank. Meanwhile, the first half of 2010 has seen a string of months with record high global temps. Sure, in a GISS world, every month is hotter than ever. All those petaflopping processors generate a lot of heat. Gates, you give Steve a hard time for a prediction, then you link to one yourself. “could”, what’s this “could” stuff? Or actually could not – it’s a 50/50 like a coin toss. Is this prediction from a “top scientist” any better than the prediction from another “top scientist” that snow would be a thing of the past? Which is it? no more snow? or more snow? Both top scientists said both. What if changes in Arctic temperatures had nothing to do with CO2? Do you see any correlation? and why is this supposed to be scary? If you mean because they “think” CO2 levels were about the same as now, and they “think” global temperatures were 2-3 degree C warmer, and they “think” it was the last warm period before another glaciation. And they “think” that even though CO2 levels were about where they are right now, we still had another ice age? They all have 100% hindsight, and can all predict the past with some accuracy. If we have no snow, some moron top scientist writes a paper saying it’s the trend of the future. If we have a lot of snow, some moron top scientist writes a paper saying it’s the trend of the future. Great, we spend billions on grants for top scientists to predict the past……. Around Monarch pass . We hunt in mid Sep. right up to the divide markers. No snow where I at one time would sit and have lunch with snow all around. Gates, perhaps you know how ironic it is that you chastise skeptics for looking at weather rather than climate, when it has been CAGW advocates who have been claiming weather events to be their proof of CAGW. Whether it was 2005 hurricances or 98 El Nino or 2010 summer Eastern heat wave or 2003 European heat wave or 2006 Canadian cold wave or 2009 above normal precipitation or 2007 droughts or 1993 Iowa rains or . . . these weather events are given as evidence of CO2-induced climate change. but the concentration is very high. Perhaps you have more urgent matters at hand, but I would be interested in your view of why Arctic ice extent this spring was “unprecedented” in IARC-JAXA time, and that this was followed by unprecedented low levels in June. “When I got my second chance the referee should have given us a free kick and Puyol a (second) yellow card,” Robben told reporters. How many decades must we wait for Greenhouse to kick in? So when weather metrics (SST, SAT, LT, Arctic, Antarctic, ENSO et al) tumble in the next 12 months, very possibly below that of 1999, and since El Nino will rear it’s ugly head again in 2-3 years, it will make 1998 look like a blip on the radar? Historically, an El Nino Modoki (which is 2010) results in a neutral SST, yet looking at the latest SST indicates it is plummeting. I don’t know, it just seems like with each El Nino since 1998, the outcome is earth losing more and more heat, quite the opposite of what we’ve been told the last 20+ years. 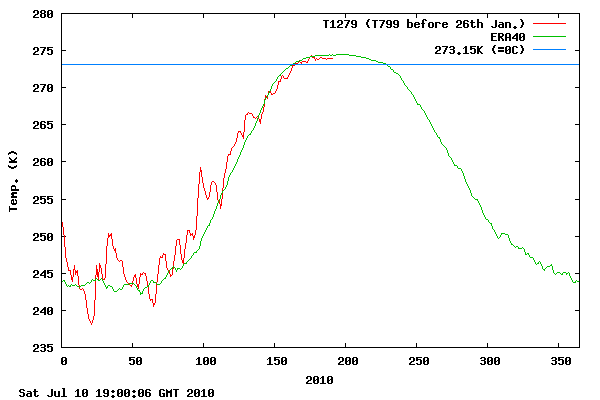 How does the Arctic continue to warm unabated when OHC continues to drop? According to Polyakov, arguably the foremost expert on the Arctic, the Arctic region temperatures have peaked and are setting up to decline. Newdscientist is like any other pro-AGW ragazine; they cherry pick only those studies that fit the paradigm. The article talks mainly about Methane which is CH4 and appears to be abundent with new drilling technology although the administration is threatening to ban it because of potential water pollution. LPG is liquid petroleum gas which is mostly propane (some butane and isobutane) that is C3H8 and is mostly produced in (USA) refneries as the result of processing crude oil. LPG is also a by product of natural gas extraction that comes along with the methane and is separated from the methane. I spent some time in Trinadad several years ago and LPG powered cars were quite common there. I rode in a taxi that could run on either LPG or gasoline. How do they look without “adjustment”? See, that is the problem. The “adjustments” applied to the raw temperatures and the removal of practically all the rural and high altitude stations biases modern results warmer. For example, in the temperature record for the state of California in the 1930’s are data from many stations in the Sierra Nevada, foothills, and the rural coastal areas. In the temperature record for the state of California in 2010 are three stations. All three are urban, all three are coastal. Want to know what the difference is between a 65F day and a 95F day in San Francisco? Wind direction. All you need is a wind out of the East to bring you a day in the 90’s. Get a wind from the West and you have marine layer gloom all day. “Back in the day” you had stations in areas where there was no such difference or it was much less. The temperature doesn’t vary as much in Truckee, or Davis depending on wind direction as it does in SF. Bottom line is that to compare today’s temperature “records” to those of 30 years ago is to compare apples to oranges. The networks are completely different with a completely different mix of station location types. Today’s data are worthless. DR, the New Scientist article that Gates linked said it was the last warm spell before another ice age/glaciation. I think they are agreeing with you. I don’t think Gates meant to. “The polar ice cap shrank to its smallest surface since records have been kept in 2007, and early data suggests it could become even smaller this summer. OK totally OT but Steve G did mention the world cup. After Nigeria was eliminated from the world cup The Nigerian goalkeeper has personally offered to refund all the expenses of fans who travelled to South Africa. To: Dirk H…. I stand Corrected about Germany. I Assumed: ugh ! … It looks to me as if we are about 2 months behind.2007. 2010’s Melt Engine definately sputtering — when will it be at Full Speed again ? … weeks ? … or Months ?? July10-11 ___ – 106.750 _____ ? ? For my edification would please show this layman the evidence that proves recent increases in atmospheric CO2 has caused the Arctic sea ice extent to be in a state of steady decline since the LIA. Also would you please explain to me why the same CO2 increase is causing a observed dramatic increase in Antarctic ice during the recent past. You need to convert to “the dark side”, before it’s too late. So what if it melts? Aee we all gonna die, be poorer, go infertile. It freezes, it melts, it freezes. Not only is melting ice NOT proof of anything CO2, is it even scary. 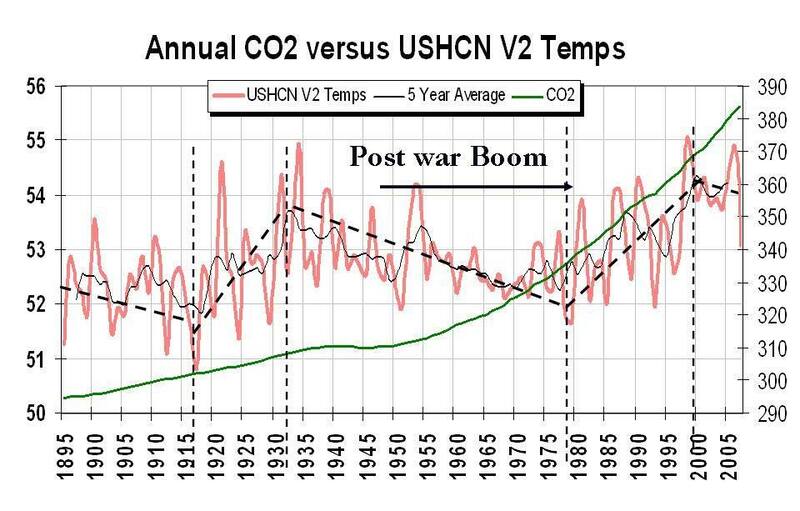 You know, I think I’m getting it now….because of this trace of CO2…. The arctic is/will be warmer, except when it isn’t…. and Ice will… diminish, except that it won’t…. and we’ll see greater NH snow extent….but none of the children will know what snow looks like….maybe because they’ll be drowning in a hurricane storm surge.. which is…. also a heatwave/drought…..? A couple tabs of LSD and it will be crystal clear! It’s a little early to claim victory just yet. The winds could change in a week, the clouds could depart and an increased melt could certainly follow. However, it is interesting to see the believers scramble. I suspect it has something to do with the recent El Niñ0. If polar amplification does not kick in with the increased temperatures over the last year, it would seem to indicate the so called “experts” got it wrong. This is a major blow to cAGW. If they got this wrong, how much more did they get wrong? I think this is one reason why we are seeing all the hopes and prayers of the believers displayed every time Steve has an article. Ok, now I’m confused. 2010 is being hailed as the resumption of global warming as predicted by climate models, yet NOAA climate models show blue covering both Poles. When was the last time that happened? Joe B is toying with the idea by next summer, temps will descend deeper than 1999. Looking at daily UAH satellite data, SST are about cross over into 2007 territory; quite a steep drop occurring. Steve, if you look closely at the NSIDC graphs from today you will notice that there are some bad scans that caused that uptick in the SH and the NH today (take a look at the actual spatial extent of the NH and SH ice—it’s particularly bad in the SH). I’ll have to look more into this problem tomorrow, but the data definitely have a problem today. In the meantime, I will point out that ice divergence happened in 2002 and 2003 (and I think also in summer 2004), and yet the first record low extents were observed. While ice divergence does spread the ice extent out, helping to slow down the ice extent loss, it can also cause open water areas to develop within the icepack, enhancing the ice-albedo feedback. Thus, at some point it could be that the ice divergence will actually hurt the extent by exposing the ice not only to warmer ocean temperatures (by pushing it southwards) but also cause enhanced lateral and basal melt from open water areas forming withing the icepack. Paper by Serreze et al. 2003 details how ice divergence led to the minimum of 2002…If the ice is indeed thin like the PIOMAS model suggests, I would expect to see an acceleration in ice loss in the coming weeks…This was especially true in August 2008 when it was clear the ice began to run out of thickness and the fastest rate of ice loss in 2008 actually occurred in August (and was the fastest on record). I can see the problem in the SH maps, but the NH graph seems to match what I have been seeing over the last four or five days. I agree that the lower concentration ice now could cause a rapid melt later, though I don’t believe the PIOMAS numbers. Their forecast maps are already way off the mark. Then my 25% skeptical side will feel validated. Though my 75% AGW side believes this is very unlikely. 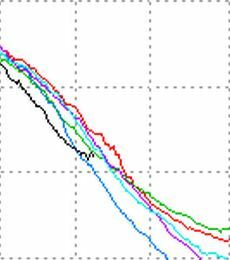 I expect at least one, and possibly several new record lows in arctic sea ice extent between now and 2015. We should see lows hitting in the 2.0 million sq. km. extent in this time frame. This is based on the increasing influence of the Dipole Anomaly as well as the increasing solar irradiance and decreasing GCR’s we’ll see between now and the Solar Max of 2013. Should we get a strong El Nino in 2012-2014, we could see even lower than 2.0 million sq. km. In this time period, I expect that the Arctic Dipole Anomaly will become stronger and and even more self-reinforcing. 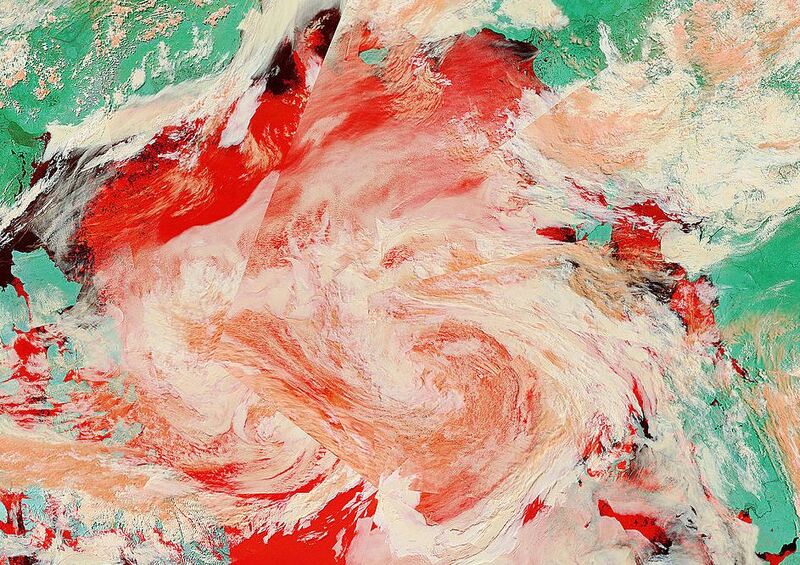 The only change strong enough to have created this new chaotic attractor is CO2. Solar Irradiance doesn’t explain it, PDO doesn’t explain it, NAO doesn’t, ENSO doesn’t. They all have their influence, but compared to the 30% increase in CO2 since the industrial revolution, these other naturally occuring oscillations are simply not strong enough. The polar amplification of AGW, now being reflected in the increasingly frequent chaotic attractor known as the Dipole Anomaly is most likely related to CO2. All other known natural cycles are simply not strong enough. This does not preclude the discovery of some as yet unknown cycle that is longer than our current accruate measurement of these other cycles. It is this type of potential discovery (though unlikely) of an unknown natural cycle that my 25% skeptical side looks out for. Steve, it doesn’t appear as bad in the NH, but if you look closely you do see it in Hudson Bay, Baffin Bay and there seems to be more coastal contamination than normal. Since these near-real-time brightness temperature data come from Marshall Space Flight Center (and are not the higher quality controlled data from RSS) problems like this occasionally occur (usually it’s geolocation errors). There are dozens of excellent books, articles, and studies on the predicted effect of CO2 on the climate and specifically on how it will be reflected first and most extremely at the polar regions, but all AGW/GCM’s show the N. Pole to be warming more and earlier than the S. Pole. This has to do primarily with the large heat sink that is the S. Pacific ocean, as well as the fact that Antarctica is covered with a pretty large piece of ice that will keep the region somewhat immune from the full effects of AGW at first. Greenland provides some level of buffering, but no where to the same extent as the Antarctica, plus of course, the Arctic has no large Southern Ocean to act as a heat sink, and with the relatively smaller volume of water in the Arctic ocean, we are seeing that the extra heating of the open water will actually work as an amplifier of warming, releasing heat later in the season, and creating positive feedback effects. Seems JAXA is showing 2010 just a shade under 2006 … if it continues like that it will be interesting. First, I am not a C-AGW believer. I’ve never talked about catastrophe’s or any such thing. First, I simply want to understand what is happening and why. What it means, in term of the implications for ecosystems, food supplies, species survival, etc. is something I’ll leave for the next few years of study. I know lots of work is being done in this area, but it’s not my main focus at the present time. Second, I try to (though I’m not perfect) look at the longest term of reliable data we have. Short term weather events are interesting, but tend to noise. Even events such as ENSO, solar cycles, the PDO, etc. are also noise, and must be carefully accounted for to see the longer term signal underneath the noise. When people talk about any specific snowstorm or heatwave or cool spell, or whatever, it is only weather noise. However, as one begins to track the frequency of certain types of weather anomalies over the longer term, how those frequencies change over time (i.e. droughts, extreme rainfall or snowfall) can tell you something about climate change….but any individual event is simply weather noise. Finally, one poster was mentioning the chaotic nature of both weather and climate, and that is true. But it is actually more difficult to predict the weather than the climate, because individual weather events seldom leave much in the way of a long term record, whereas the climate leaves us lots of clues in ice cores, tree rings, ocean sediments, etc. I like the example of boiling water to understand the difference between weather chaos and climate chaos. When you put a pan of water on a hot burner, you can predict that the water will boil at some point, and even predict with reasonable accuracy when that water will reach a full boil, if you know variables such as the conductivity of the pan, atmospheric pressure, purity of the water etc. This is like predicting the climate. However, you can’t predict exactly where the first few bubbles will appear or where subsequent bubbles will appear except until a few seconds before they actually appear. This is like predicting the weather. An Inquirer, do you know the difference between “advocates”, as you call them, (I refer to them as those who are uneducated and slightly educated on the subject) and the actual Climatologists and those who know enough to speak carefully on the subject. It is when these events are taken collectively that they constitute proof of Global Warming. Once you give the big picture you can then highlight specific events. It is the Skeptics who are always failing to give the big picture in both time and space making them perpetual cherry pickers. Bottom line, according to Climatologists 30 years minimum is what makes a trend as far as the Arctic Sea is concerned. If you click my name link and open the little calendar Icon, then fast forward to 2013, you will be able to see my daily forecast for all of 2013. Thanks for the compliment on how tough it is to forecast weather years into the future. Let me know what part of the year you think will be affecting the Ice growth / loss the most? R. Gates, the link you provided got me to a report headed: “Europe, US to see snowy, cold winters: expert”. You see, that is why I am skeptical about AGW or, as it is now being called ACC. Because AGWers are always changing the goalposts to suit the erratic antics of climate change. During the nineties, snow was very lacking in Europe. In 1994, in Denmark 6 year old kids did not know what snow was. IT HADN’T SNOWED FOR YEARS. So, AGWers took this 5 year old graph and extrapolated it into the future, telling us what we have been hearing since then, such as, ‘children will not know what snow is’ etc etc. But climate being climate, chaotic and all that, we are now having record snow covers, low temperatures etc etc. This proves one thing at least: That climate is UNPREDICTABLE and no computer model will be able to predict it. My point: 15 years ago we had low or no snow in Europe, now it has returned with a bang. 15 years ago we were told children will not know what snow is, now we are being told to prepare for snowy, cold winters. How’s that for integrity? One other point: Arctic and Antarctic sea ice covers have been monitored for only a few decades, since we started putting satellites in orbit and I think that there cannot be any proxy measurements of past sea ice cover anomalies. However I have seen photos taken by submariners during the 50’s that show a near ice free sea at the north pole. That was when CO2 level increases were still insignificant. These last two were supposed to be the smoking gun of AGW. Meanwhile, Mister Mann has told us an ice free artic is on the way! Reality is more important. What happens is more important than what was predicted .I cannot change what will happen this September by hoping some outcome will occur , I don’t have to accept your model of what will happen this September I would rather wait and see what happens. As has Steve. In 2065 I believe (sooner than the IPCC). You know, I missed that symposium. Please detail which papers disprove my conclusions. Thanks again for this-and your other- articles. You cite several graphs showing ice thickness. How much reliance should we place on these do you believe? i seem to recall that last year it took a German plane flying low over the Arctic ice with an elaborate radar device to establish thickness over the part of the Arctic the Catlin team had just wasted their time measuring. If satellites are so good surely the German expedition would have been pointless-I don’t think they were claiming 100% accuracy either. 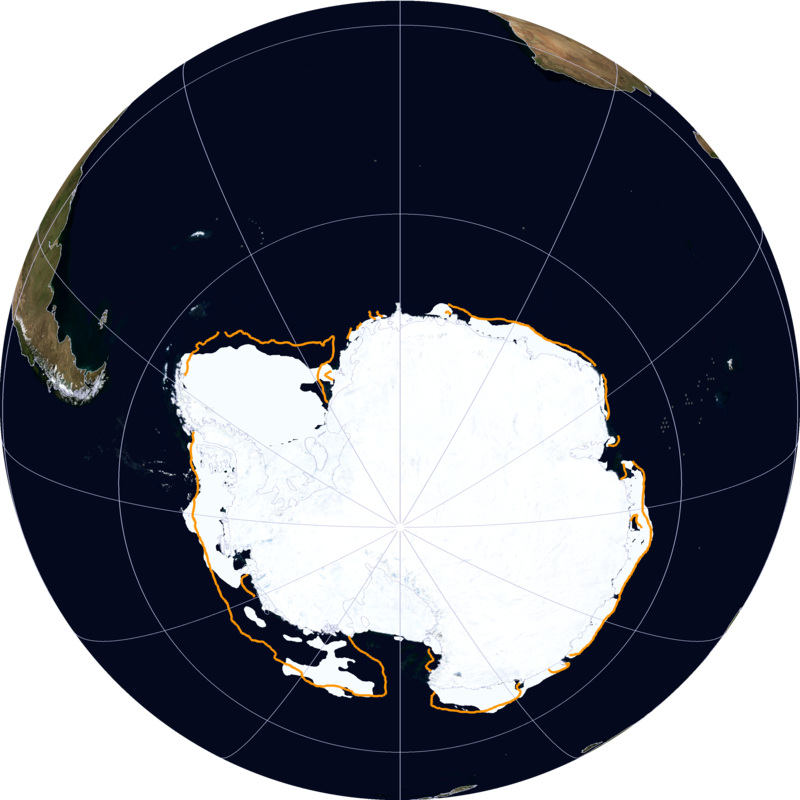 Also, I thouight that satellites found it difficult to distinguish between melt water on top of ice and the ocean. Is that still so or has that problem been resolved? NSIDC keeps telling me that the PIPS ice thickness data is not accurate, and at the same time they tell me that PIPS is constantly updated with the best real time data. Go figure. The PIPS data seems to be working extremely well as a predictor of trends, particularly the current similarity to 2006. I don’t think he was ready for you to say that. I think he wanted the reader to infer that just because you weren’t there that disproves your conclusion. Nothing deeper than that. I wouldn’t wait for any details from papers from him. Global warmers, just know I have a bag full of ‘shhh’ with your name on it. Much work has been done to hindcast the arctic sea ice volume before satellite records. The following graph on the retro page of the Polar Science Center Retro page illustrates the estimated thin ice during the 1950’s and the rapid growth during the sixties. 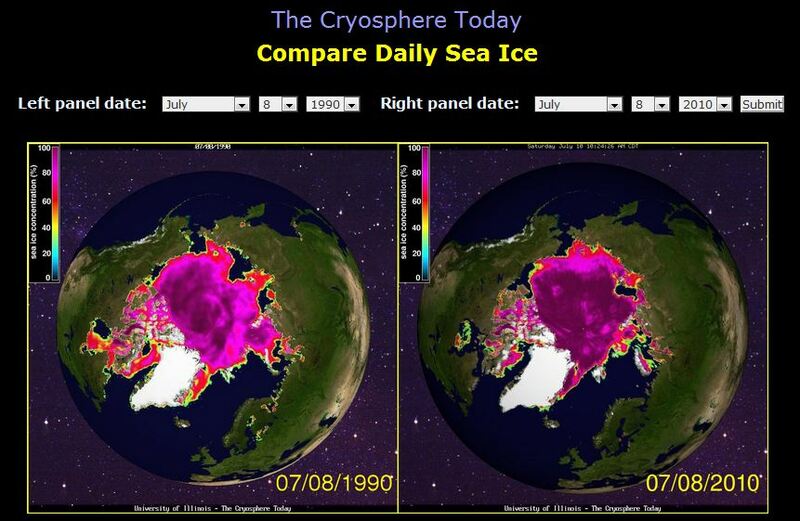 The main PIOMASS page starts in 1980 I think in order to make the current sea ice volume look worse. The current estimate of the sea ice volume from PIOMASS as Steve points out is suspect. They made the estimate without the use of the iCESAT satellite to keep them honest. I think Steve is dead on with the PIPS data and will be vindicated from CryoSAT 2. Can I put you down as forecasting a big melt the rest of the summer? My forecast is on the table. Which is actually a brief abstract with no link to an actual paper and really nothing that says it was anything more than a presentation. Which looks like the presentation by the esteemed Dr. David Barber of “rotten ice” fame that various Arctic Ice Death Spiral proponents have been posting links to on WUWT for well over a month now. In other words, you have supplied nothing of interest. the rotted ice thing isn’t panning out. Look at what is really happening in the real world. the rotted ice thing isn’t panning out. have you watched the presentation? he is talking about high temperatures (-2°C) on the sea and ice, when land based stations are reporting very low temperatures (-20°C). some of us are simply a little bit sceptical about Steven being better informed than the guys who have been out in the ice this year, and for 30 years. Kadaka, those presenters who also chose to write a paper will have their results published in the next issue of Annals of Glaciology. Dr. Notz’s presentation was one of the more interesting papers presented at the IGS meeting last month. My talk will be published in Tellus and Climatic Change (both papers have been accepted for publication). I guess we will know in about seven weeks. Granted I have not read the paper, but one in 10,000 years? Does He really believe that sea ice extent/volume was lower in 2007 than during the time of the Viking settlements of Greenland? He acknowledges “inhomogeneities” in the available observational record like maybe Captain Cook’s search for the Northwest Passage when there appeared to be a low in sea ice extent possibly similar to today. Whatever else may be the case, R. Gates has a point about you being selective about the data you choose to display. A mere 6 days ago, when Berényi Péter linked to the IARC-JAXA AMSR-E Sea Ice Area chart (http://www.ijis.iarc.uaf.edu/seaice/extent/AMSRE_Sea_Ice_Area.png) your reaction was “Excellent link! I hadn’t seen that one before. Worthy of an article.”. The next day you featured it prominently in your post “Take a right turn to Ice Station Zero”. Now it doesn’t seem to merit inclusion, nor does any other measurement of arctic sea ice area, despite your stated belief that “Area is a better indicator (than extent) of melt, because it is not affected as much by wind shifting the ice around.”. A cynic might be tempted to think you no longer consider that chart worth showing because it now shows the arctic sea ice area dropping over the last several days at a similar rate as during the same period in 2007, which wouldn’t be very helpful in supporting your statement in this post that “The sea ice graphs have nearly flatlined since the beginning of the month.”. that completely destroys his credibility. was the arctic ice free during the medieval warming period, which was much warmer than today? was the arctic ice free during the roman warming period, which was even warmer than the medieval? The holocene optimum, even warmer yet? does julienne have an opinion? Peter, I disagree with you that Barber completely destroys his credibility by saying “we can argue whether it’s been 1.4 or 5 million years since that happened.” The reality is we don’t know with certainty when the last time the Arctic Ocean was completely ice-free in summers. I would think if the Arctic Ocean was completely ice-free during summers in the Medieval Warm Period, there would be evidence (stories,songs,writings, etc.) that talk about people sailing across the Arctic Ocean. Dr. Barber has done a lot of great work in regards to sea ice, and I don’t see how this statement makes all of his work invalid. I also disagree with the statement that temperatures were warmer in the MWP than today. Northern Hemisphere reconstructions do not show that (nor does it appear that the Roman warm period was warmer than today). Of course you can argue about the accuracy of such reconstructions, but doing temperature reconstructions is not my field of expertise, so I’ll bow out of those arguments and leave it to the experts working in that field. 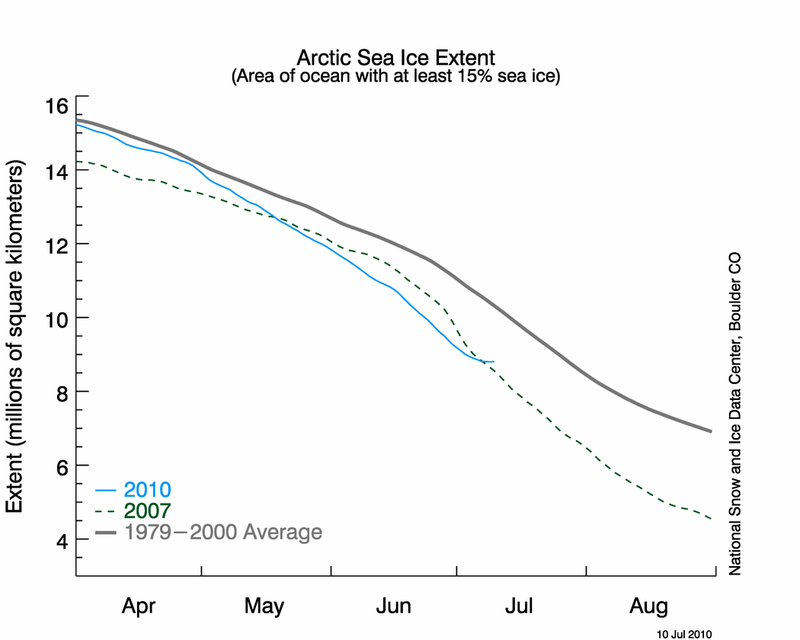 I predict that Arctic ice will increase in extent this winter, and decrease again next summer. It “reverses” twice a year – every year. All of the graphs show the same thing. Flattening since July 1. 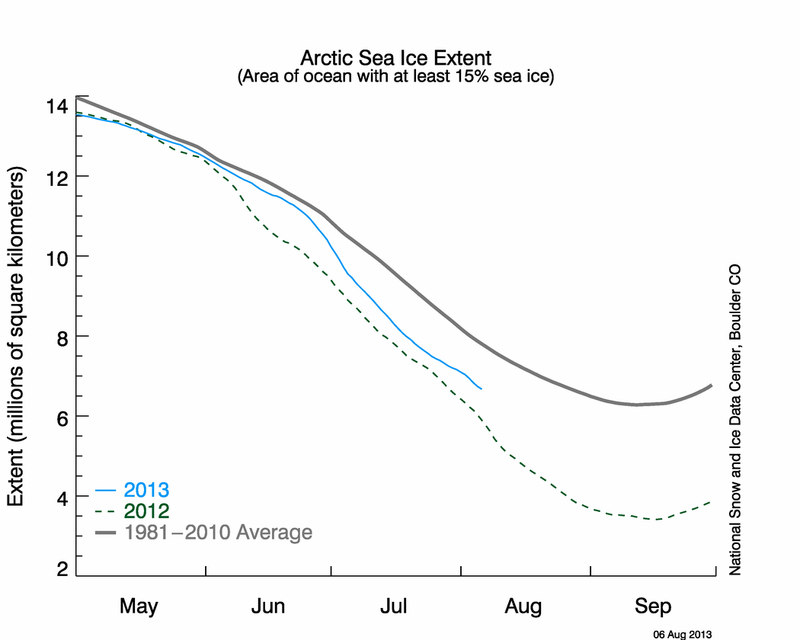 April-September, 2013 will affect Arctic Sea ice loss the most. Judging by the rising solar activity (to peak in 2013’s Solar Max event), and the rising frequency of the Dipole Anomaly, you can put me down for a very early forecast of 2.5 million sq. km. Arctic Sea ice extent in September of 2013– less of a forecast than an educated guess, but more importantly, I’m still quite comfortable with the 4.5 million sq. km. forecast for the minimum this September 2010. Gates, every time you bring up CO2 related changes in the Arctic Dipole my opinion of your posts plummets, but when you bring up anything related to some kind of solar max connection to all this my opinion disappears all together. But just to give you the floor, explain what you mean by “chaotic attractor” as it relates to weather events (and make no mistake about it but atmospheric dipoles are weather related events) under your CO2 scenario. That phrase is meant to sound scientific. So explain it in scientific terms instead of tossing it around like salad croutons. And you still haven’t explained how CO2 is related to dipoles. Dipoles are not caused by warm water. They are caused by warm and cool ocean pools setting up next to each other. How in the heck can CO2 set that up? Longwave infrared cannot force ocean pools to warm up. So what is your mechanism? And don’t refer to a paper. Tell me exactly what the CO2 mechanism is that can powerfully and sustainably set up a dipole. I know how trade winds and oceanic current oscillations set up dipoles. And I don’t need to just refer to a paper. I can tell you how it happens AND refer to references. Please do the same. I don’t know Steve, that seems like a pretty bold prediction. You’re really going out on a limb there and putting your sea-ice god reputation here on WUWT on the line. Would you even go so far as to say that those reversals will be approximately 6 months apart? That would be quite daring of you! Notice Gates that I didn’t ask you to explain your solar max comment somehow being connected to strengthening the effects of El Nino’s which are somehow strengthened by CO2 in the atmosphere. Please don’t explain the solar max connection to me. It won’t help your response in this debate in my opinion. Gates, the frequency of dipoles have not risen when referenced to the long term reconstructed record. Please state your opinions as opinions and not facts. Your belief in a rising frequency is an opinion, not a fact. There are AGW scientists who have reported peer reviewed evidence that there is no correlation between CO2 and dipole frequency. Hmmm, 2010 is close to 2006 on JAXA…. Interesting! Maybe there is natural cycles after all? Will someone inform Hollywood, Al Gore and the IPCC, please? Lets look at temperature reconstructions from ice cores in Greenland (GISP2) as it is as close to the arctic as we are likely to find data. It sure looks like to me that Greenland has been primarily warmer than today for the last ten thousand years. I think that it is clear that the models predict that this information will be homogenized by The Warmists Consensus. Pamela, I’m sure you do understand how outsized warming in the Arctic can alter the temperature gradient between the equator and the poles, and subsequently influence atmospheric and oceanic circulation. And you probably understand how regional changes in sea ice extent can influence the development of cyclones (low pressure systems) via the strong temperature gradient between ice and open water, and perhaps you are also aware of other regional influences on atmosphere circulation such as those caused by differential heating between the land and the ocean. So if rising concentrations of CO2 are in any way responsible for warmer Arctic air temperatures, changes in the ice edge position, changes in the timing of snow melt, etc. that is how CO2 can influence atmospheric circulation patterns. Nevertheless, to say the DA is caused by CO2 is inherently difficult. Cause and effect cannot be separated from a purely observational perspective. It is only in climate models simulations that you can run controlled experiments to try to isolate such a linkage. Some earlier studies suggested a positive AO would be expected under increasing concentrations of CO2. Other studies suggest more negative winter AO state as there is more open water in September. I don’t know of any specific modeling studies looking at the DA however. Gates, the frequency of dipoles have not risen when referenced to the long term reconstructed record. Pamela, what long-term reconstructed record of the Arctic Dipole Anomaly are you referring to here? R. Gates is specifically talking about the Arctic Dipole Anomaly, perhaps you do not understand how this is computed? I am only now really getting into understanding the heart chaos theory, and it has so many parts to it, but let me attempt to give chaotic attractors, as they might relate to the weather and climate a very simple (and I hope, fairly accurate) explanation. Dynamical systems, such as the weather and climate can be described in terms of their phase space, or the projection or mapping of their dynamic qualities or current state for any point in time. A chaotic system is one in which (while still governed by deterministic causes) have far too many interrelated causes that an exact prediction of where in phase space a system might be is impossible. Also, of course, the smallest change in any one of the interrelated elements of the system, such as CO2 for example, can cause big changes in the entire system. A attractor is essential a set of points in phase space where a dynamical system is trending towards. This phase space project could be as simple as a measurement for example of an average monthly sea surface temperature and sea level pressure over a region of the Arctic, such as the Beaufort sea. So, in a very simplified way, a chaotic attractor is a unpredictable yet deterministic set toward which a dynamical system is trending toward. Attractors (or the set of points in phase space) are self-reinforcing, meaning that once a dynamical system begins to trend toward them, it will be reinforced and accelerate toward that attractor. This is not unlike the pull of gravity and the inverse square law, though attractors have far more elaborate shapes than a simple gravitational field. So, the hypothesis is that increasing CO2 (40% increase since the industrial revolution, not the 30% I mistakenly gave before) is all of the nudge, that the dynamical system of the Arctic needed to send it toward a new attractor (or more likely, attractors), and that one of these new attractors involves a more frequent and stronger Dipole Anomaly, which like all attractors, has a self-sustaining consistency based on it’s shape in phase space, such that the more the dynamical system is pushed toward that attractor, the more it will exist in that region of the attractor’s phase space. In physical terms, especially related to the Dipole Anomaly, which contrary to your contention, seems to be showing increased frequency, and is self-reinforcing. The climate experts would state this a positive feedback loop related to the polar amplification of AGW, specifically related to more open water in the Arctic releasing heat later in the season, that tends to change the wind patterns, creating the warm conditions for more open water in the Arctic, changing the wind patterns, etc. So to answer your statement: “Dipoles are not caused by warm water.” Well, yes the Arctic Dipole ANOMALY does seem to be related to warm water releasing heat later in the season, creating the conditions that will favor more open water the next season. The above referenced links speak to this. But it may be better for someone such as Julienne to explain the release of heat from the larger areas of open water we’ve seen the past few years, and how this might help reinforce or create the DA. Of course, underneath all of this is the energy imbalance of the planet created by the 40% increase in CO2 that has happened since the industrial revolution– from 280 ppm to now around 390 ppm. This seems to be all the nudge the dynamical system needed to send it toward one (and probably several) new attractors, as CO2 continues to increase. Your response “All of the graphs show the same thing. Flattening since July 1.” is plainly incorrect. The 2010 line in the chart at http://www.ijis.iarc.uaf.edu/seaice/extent/AMSRE_Sea_Ice_Area.png was clearly declining less steeply on July 1 than it has been since. In my version of English, “steepening” is the opposite of “flattening”. I expect that is the case in your version as well. that shows NH temperature reconstructions from several different groups doing this kind of work (plus links to their papers published on the subject). Perhaps some papers by Richard Alley would be worth reading…he has done numerous ice cores in Greenland. At least China has been having a record-breaking heat wave this summer, and then, what about the record setting heat in the Eastern US the first week of July? This winter, the sea ice cover at the SP is at an ALL TIME RECORD. I think you need to be more skeptical. Julienne, take the time to read Polyakov’s research on oscillation (both long and short term) interactions in setting up ice build up and ice flush. The “Arctic Dipole” is nothing new. The pressure gradients necessary to set up the “Arctic Dipole” can be done with modeling of the various reconstructed records of atmospheric positive and negative pressure systems (AO, NAO, etc), including their short, noisy fluctuations and long term oscillations, without regard to CO2. 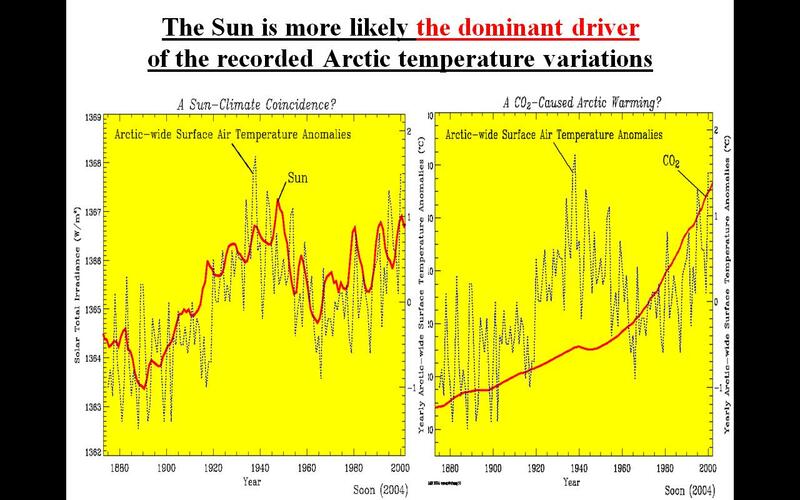 The system being talked about in AGW circles as the “Arctic Dipole” is not new nor is it increasing in frequency because of CO2. It has been demonstrated in the records and modeled, to be a naturally occurring event caused by the unique parameters of the oscillating oceanic and weather pressure systems that press upon the Arctic Circle and it’s ice behavior. Very excellent website on the multidecadal research project. Meant to educate in laymen terms. The graphs are eye candy. Now I know that Dr. Zhang (of the PIOMAS fame) and Jeff Masters from the Weather Underground are possibly not too popular with some on WUWT, but I think the data they present, and your own further research may lead you to see that the Arctic Dipole Anomaly has been far less of an anomaly (i.e. occurring far more frequently) in the past decade, and as the charts from NOAA clearly show, there is a relationship to warming in the region. Hence, the DA, while a wind/pressure anomaly, seems to be spawned by temperature anomalies. The real question gets back to the cause of the warming and whether or not it is part of a natural oscillation or has been set in motion by the (geologically speaking) rapid increase in CO2 since the industrial revolution. Pamela, I have read all the papers on the Arctic Dipole Anomaly, some more than once. I simply am unaware of anyone providing a long-term data record on the Arctic DA. I suppose by here you mean the work by Polyakov that goes back to 1880? I thought you were talking about longer term work. BTW..the DA is the second EOF of SLP north of 70N (so it does not take into consideration exchange of atmospheric mass between the mid and high latitudes) that the AO index does. I’m not sure if you’re suggesting the AO has become a dipole pattern. That is not the case. The dipole pattern has become more prevalent in recent years, with some indication that it’s not more common into spring than previously. It also seems that the dipole is simply one finer-scale component that combines with others to manifest as the annular mode. Any interpretation that the AO as become a dipole is a complete misunderstanding of the literature. I would say that the greatest driver is one step back from wind. The drivers are atmospheric pressure gradients driven by SST changes that contribute to land and surface air temperatures. These atmospheric pressure weather pattern variations, both long and short term, drive the ice to build or melt, and to move or stay in place. To wit, they can change the temperature rather quickly in the same spot under the exact same conditions with just a change in pressure gradient. We have had lots of Sun today. And lots of Sun yesterday. But the temperatures throughout the day have been significantly different between the two days. Hot and still yesterday, cooler today. Nothing has changed physically. No one peeled back the grass to reveal concrete or asphalt where I live (IE albedo has been the same). The Sun was shining as brightly on my porch today as it was yesterday and there was no difference in clouds (we had none). So why the change in temperature (from over 90 to under 80)? Pressure gradient changes have kicked up a cooler and much dryer air mass that is moving rather quickly from West to East over these high plains and mountains. In my opinion, and from what I have read in the literature, changes in pressure gradients cause changes in ice. Interesting that AGW’ers are now saying that CO2 affects pressure gradients (Re: Arctic Dipole). Somehow. Meaning that CO2 will eventually be said to cause weather, the current bad boy in the class, while they run through the teacher’s pets. 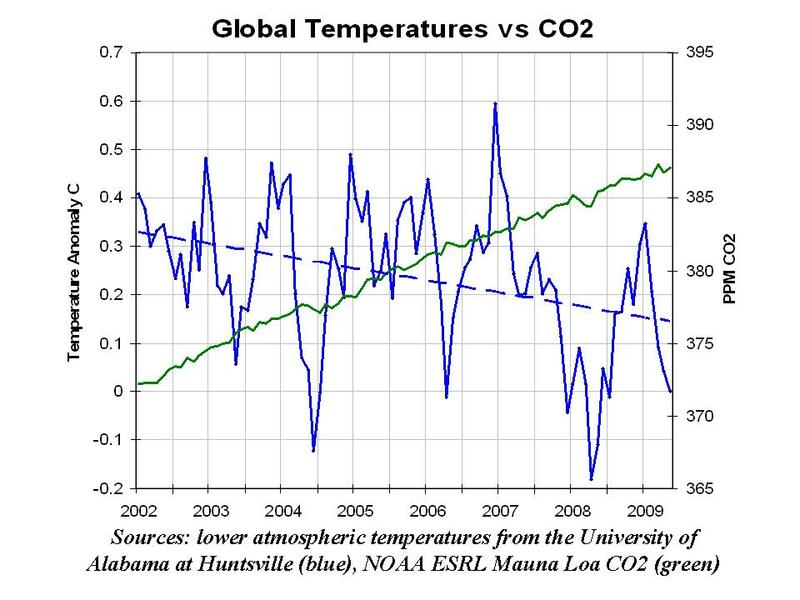 And so the search continues for a correlation, any correlation, Ferris Bueller, anything at all, to connect the rather odd looking straight CO2 trend with our incredibly noisy oceans, lands, and atmosphere. I’m almost to the point where I wish they would find the damned thing. I would say that the greatest driver is one step back from wind. The drivers are atmospheric pressure gradients driven by SST changes that contribute to land and surface air temperatures. You’ve just described the behavior of the Arctic Dipole Anomaly exactly. I will remember that. 2013 stands in my mind for another reason. Back in 2008, Gavin Schmidt was being pestered about what would cause him to reconsider his dogmatic view that CO2 emissions were leading to problematic temperature increases. Though he tried to avoid the question several times, he eventually said that if the 1998 record was not exceeded by 2013, then he would reconsider. So I am looking forward to 2013! Pamela, it’s a matter of linkages and it seems you don’t want to examine those. Any impact from increased concentrations of atmospheric greenhouse gases starts first in the atmospheric temperatures, which can then also affect atmospheric circulation and oceanic circulation, distribution of snow/ice, precipitation, clouds, etc. etc. By having more open water in September, there is a new heat source to the atmosphere. Observations show clear autumn temperature anomalies in recent years of > 1C well up into the lower troposphere. These higher temperatures decrease the atmospheric air density and raise the height of upper-air-constant-pressure levels over the Arctic Ocean. These increased heights north of 75 °N weaken the normal north-to-south pressure gradient that drives the normal west-to-east airflow in the upper troposphere. In this sense, the effect of higher air temperatures in the lower Arctic atmosphere is contributing to changes in the atmospheric circulation in both the Arctic and northern mid-latitudes. For example, Honda et al. (2009) suggest a remote connection between loss of Arctic sea ice and colder temperatures over eastern Asia. See Francis et al., 2009 for more discussion. The bottom line: changes in air temperatures influence atmospheric circulation. You can argue how much a change in CO2 has affected a change in air temperature, but to argue that air temperature changes do not influence atmospheric circulation has no basis in reality. Goodness. Do not put words or sentences or assumptions in my writing. I have never indicated in any post that the AO has become a dipole. All I am saying is that dipole pressure gradients have been a component of the Arctic for as long as we have records of ice behavior. A dipole is simply two different pressure gradients next to each other. Sometimes it physically shifts so that only one is prevalent over the area in consideration, or sometimes the strengths between the two are weaker or stronger. Atmospheric dipoles are in places other than the Arctic as well and also show no influence from CO2. Those recent increasing tropospheric temps welling up are most likely the result of warm Atlantic currents invading the Arctic, not CO2. The correlation is stunning between that current and Surface Air Temperatures that rise into the troposphere. So you must, for your hypothesis to stand, show how CO2 is correlated to the SST of the North Atlantic current into the Arctic. Graphs clearly show it is not. Further, I do not disagree that changes in air temps influence circulation patterns (I am all too aware of thunderheads and storm cells occurring around rising warm air), but large pressure gradients between warm and cold fronts are dictated by oceanic parameters in the area we are considering, and it is that interaction that determines air temps. Topography comes into play over vast land tracks but even then, oceanic influences are strong. Greenhouse gasses and aerosols affect air temps, but only a bit and only temporarily. To state your anthropogenic case, you must correlate CO2 with oceanic SST oscillations. And you cannot. Period. End of argument. Pamela, the autumn warming that I talk about is not a result of warm Atlantic currents invading the Arctic, it is a direct result of more open water in September from the loss of Arctic sea ice. You might want to read up on the impacts of the loss of sea ice on atmospheric circulation and latent and sensible heat fluxes. There are also several papers on how snow cover fluctuations also impact on atmospheric circulation. You seem to only want to believe that ocean currents are responsible for atmospheric circulation. Guess you’ve never lived near the rocky mountains. Nevertheless, I challenge you to find a publication that shows that the Arctic’s atmospheric circulation is only influenced by SSTs. Julienne, I have to say that your comment about CO2 affecting weather related precip, clouds, etc, means that you are saying CO2 affects weather. Right? That is quite a statement. Have you ever lived on the coast? Air temps do not affect ocean temps. It is the other way around. There are books and books of research that shows that oceanic temperature is the beginning of weather in coastal areas. If we go back a step from oceanic temps we are left to discuss ENSO, trade winds and the Coriolis affect. So now you must tell me how CO2 changes have affected ENSO, trade winds and the Coriolis affect. Worth noting at this point that average daily ice loss for the past 2 weeks has been about 65,000 sq km per day. 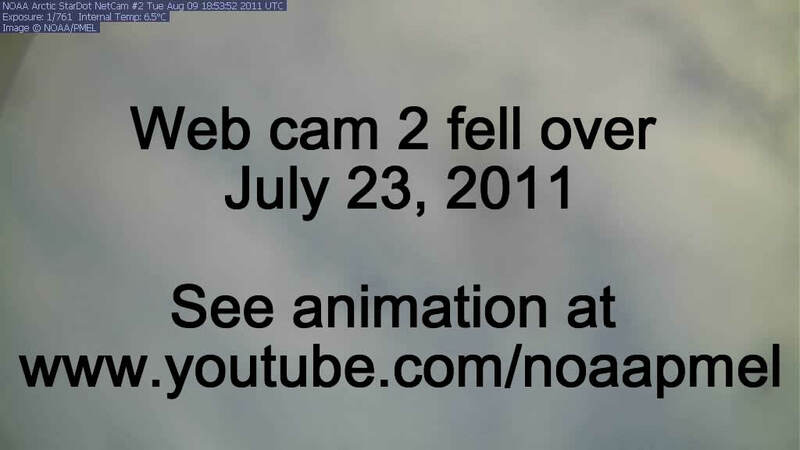 For the period 13th July to 31st July 2009, the ice loss according to IARC-JAXA data, was about 91,000 sq km per day. 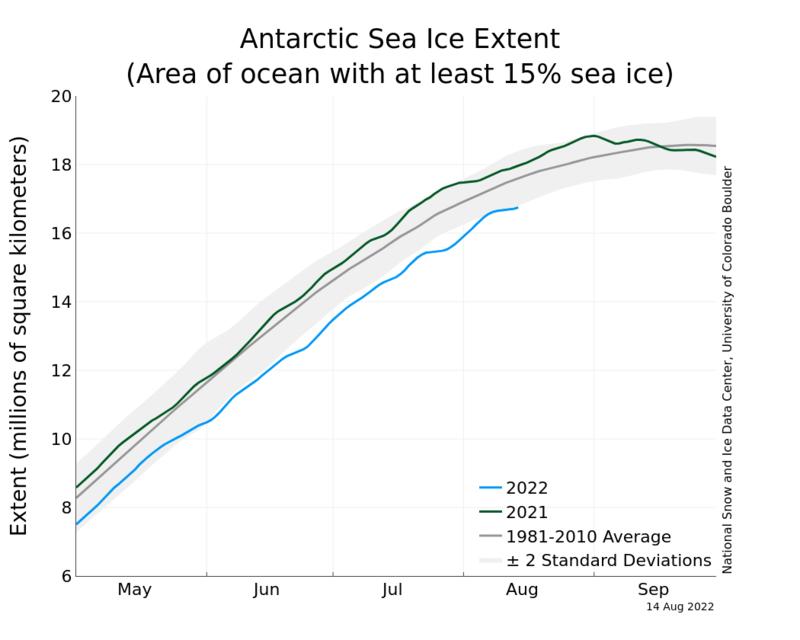 If the current slower rate of ice loss continues, by the end of July, the 2010 ice extent will closely match the 2009 result. Unless of course R Gates is right in forecasting an increase in the rate of ice loss in line with what happened 2007. Personally I don’t really see the 2 years as comparable but we’ll know soon enough. Those recent increasing tropospheric temps welling up are most likely the result of warm Atlantic currents invading the Arctic, not CO2. 1) It is the late season release of heat from open water that seems to be a key factor in the SLP changes. 2) The location of inbound warm Atlantic currents would not seem to match of with areas of open water. 3) Finally, even if some additional TW of heat is coming in to the Arctic from the Atlantic (and also from the Pacific), we know that there are some who would state that even some of this heat is coming from the additional forcing from the 40% additional CO2 in the atmosphere since the 1700’s. But provide some links to research, and I’d gladly read up on this conjecture. Pamela, I’m not sure how I can explain it so that you understand. I’m not saying CO2 is responsible for all the warmer air temperatures. Yes I believe GHGs result in warmer temperatures than without them, but I understand the difficulties in separating out the signal of CO2 in the current temperature record. You keep saying that CO2 can in no way affect atmospheric circulation. By saying that you are saying that CO2 has no effect on air temperature, and that air temperature does not influence atmospheric circulation. You are also saying that the location of the ice edge does not influence atmospheric circulation, or that more open water influences the transfer of latent and sensible heat fluxes, or that a change in distribution of snow cover can influence atmospheric circulation, etc. etc. I do not agree. So we can start with the basics. Show me how CO2 does not affect atmospheric temperature and how atmospheric temperature does not affect atmospheric circulation. That would be a good place to start in order for you to prove your point. I think negative feedbacks are overlooked in the climate models, aren’t they? This is a persistent counterpoint to global warming that is either not believed or not understood by those who think co2 is causing warming. There is a pendulum in weather/climate that is not controlled by co2 but rather negative feedbacks seem to have the last word. By the way, warming stopped in 2001, or 1998, depending on your point of view. I prefer 1998. The following is an excellent pdf of the interplay between trade winds, SST, air temps, etc. I am sure that SST is a huge driver of weather (including over the Rockies), but what causes SST changes? I think it is the larger atmospheric weather pattern we refer to as Trade Winds. What causes changes in trade winds? Don’t exactly know but I wonder if it is the energy imbalance involved in a pendulum system. So Julienne, we are not far off in an agreement. I just don’t think CO2 is driving the changes, any more than I think Solar influences are driving the changes. And I don’t think the changes are anything new. 3) Finally, even if some additional TW of heat is coming in to the Arctic from the Atlantic (and also from the Pacific), we know that there are some who would state that even some of this heat is coming from the additional forcing from the 40% additional CO2 in the atmosphere since the 1700′s. No the burden of proof is upon you to provide your references to real-world, scientifically proven evidence for your theory. But you won’t becuase you can not. You are as slippery as the jellyfish they are catching in our starving seas. I just don’t think CO2 is driving the changes, any more than I think Solar influences are driving the changes. With all due respect, Ms. Pamela….please do not lump the solar example in with the CO2 one. They are not remotely in the same league and are a false comparison between the two. I saw this in video from one of the presenters at the 4th Conference. It’s an interesting way to think of smaller oscillations that happen in climate within larger warming or cooling changes in climate. I also, like you, don’t think co2 is the larger arm. You’re right, the cyclical solar influence (via solar cycles) is far smaller than the steady 40% increase in CO2 we’ve seen since the 1700’s– so don’t compare the two. You’re right, the cyclical solar influence (via solar cycles) is far smaller than the steady 40% increase in CO2 we’ve seen since the 1700′s– so don’t compare the two. Not even worth responding but I will anyways. You are gonna be a lot harder pressed to show any (zero zilch nada) correlation with Co2 whatsoever., than you are maybe making a link with the thing that takes up 90% of the mass in the solar system and may just affect our climate. The worst part about this debate is not dealing with logic but with your constant spin, R.
I post this one more time. Will he have honor enough to respond thoughtfully? Explain (and back up with evidence) what you said in number 3 above. Attractors are very easy to understand. The climate models don’t work, there is too much complexity to keep track of, there is too little known of how climate works and all the processes involved to successfully model it anyway. The evidence that what is happening now is within normal variability and that there are natural feedback mechanisms that will prevent catastrophic warming with devastating effects, is growing. Faith in (C)AGW is failing, as the planet itself reveals the deficiencies of the theories used by the modelers. Climate and weather, the two sides of the same coin, is known to be stochastic, chaotic, its capricious nature refusing to be accurately modeled. Plus, most damning of all, sites like WUWT and others are showing you do not need a special PhD in Climatology to understand or just grasp what are the real drivers of climate and realize why the models fail. Ordinary people can be shown why (C)AGW as presented does not work. Thus we now have attractors. Systems can look stochastic but really be deterministic, the chaos is illusionary, and if they are deterministic then they can be accurately modeled. It does not matter how pitifully little is really understood about how climate works, which will not be resolved for many decades. Nor does it matter how tiny is the amount of actual physical data we can currently meaningfully measure of things that are considered related to climate, and it is very likely there are many other things that need to be measured to get the whole picture that we are not accurately and comprehensively measuring at all. It does not even matter that a grand model using attractors with absolutely everything included to accurately predict the climate would need to be run on a mega-supercomputer the approximate size of Titan. Because they can cite attractors, they can say there is no randomness, climate can be successfully modeled, accurate predictions can be made. Only those at the highest levels fully understand attractors, thus only they can truly understand climate, thus those who do not know attractors do not know climate thus they are not to be trusted as they attempt to disprove the models despite their appalling ignorance. Appeals to authority are now perfectly reasonable, because attractors explain climate and only Climatologists understand attractors and how they explain climate, and no one else but them really understands climate, and really understands why this excess CO2 will kill us all if we don’t immediately initiate a strongly-enforced global carbon regulating regime. Attractors are the new robes worn by the High Priesthood of (C)AGW to reaffirm their superiority by displaying how once again they are the sole Keepers of the Deep Mysteries of Climate, thus the heretics and pagans know not what they don’t know thus are automatically discredited and their dissent is worthless. Said new robes being sorely needed since the old ones were stripped from their backs, shredded, trampled, then maliciously burned in the street without the purchasing of carbon offsets. Actually there is correlation with the sun and climate. I’ll post two videos of Nicola Scaffeta. I wasn’t aware that the IPCC had used a solar proxy starting in 1975 instead of instrumental reading for their solar data until I saw these videos. The proxy shows no increase in solar activity from 1975 onward. Instrumental readings do. Now I understand how they claimed there had been no increase in solar activity. “Trick”y, huh. … Thus we now have attractors. Systems can look stochastic but really be deterministic, the chaos is illusionary, and if they are deterministic then they can be accurately modeled. … It does not even matter that a grand model using attractors with absolutely everything included to accurately predict the climate would need to be run on a mega-supercomputer the approximate size of Titan. But even with the attractiveness of chaotic theory, the CAGW alarmists fail: They praise with great verse the great smooth curves of the beach, the rocky headlands jutting out into the ocean, and the strength of the individual waves; then attempt to model the individual grains of sands and forecast what the beach will look like in 100 years, then claim doom and catastrophy by extrapolating their model to 1000 years for political purposes. And money, power, glory, and fame. They extrapolate “up” from each grain of sand the chaos attractors and Mandelbrot curves that, in the world’s truth, can only be calculated “down” from the massive to the infinitely small. And, at the world’s level of a grain of sand being moved by the waves irregularly, randomly, and catastrophically, don’t exist at all. All the while their 100 year modeled forecasts – and 1000 year predictions of doom – ignore the river flowing into the cove and the ocean current flowing down the coast. That does sound reasonable, and that is one reason why I no longer am a believer in CAGW. Increased frequency of adverse weather is not there. And I do not see anything unusual in temperature trends or sea level trends, especially when you consider long term trends that started before CO2 became an issue. Well, I was referring to statements by Hansen, Schmidt, Jones, Mann, . . . . Some may refer to them as Climatologists, but if you prefer to call them “uneducated and slightly educated on the subject,” I’ll let it go at that. This quote alone shows me that perhaps you don’t understand the nature of chaotic attractors as well as you think. Chaos theory is not about randomness, but about unpredictable but determinisitic factors, i.e. real causes that have real effects at very specific threasholds, but none that we can predict exactly. Put a pan of water on a hot burner and I can tell you that it will come to boil, and if you tell me exactly how hot the burner is and the heat transfer properties of the pan, and the purity of the water, and the atmospheric pressure, etc. I can tell you reasonably well when the pan of water will reach the boiling point…however, I can never tell you exactly where and when the first few bubbles will form– this is the heart of chaos theory. Deterministic and unpredictable and leads to real effects. Chaos is not illusionary, it is simply not predictable, and certainly NOT random. Except there are always the deux ex machina to worry about. The cat which walks across the edge of the hob controls, the steam from the pan which sets off the sprinkler system etc. This is why the models are crap. That and they don’t know that clouds are a negative forcing. And hundreds of others that you can easily google and find for yourself. If you really actually read the literature and research, it is not an issue of whether or not the oceans have been warming and acidifying, (with CO2 as the culprit) it is really that they seem to not have warmed as much as the should (i.e. the travesty of the missing heat from Dr. Trenberth). But I’m quite aware that nothing I post shall satisfy you for you are a true believer. You are talking about randomness, and that has nothing to do with Chaos theory or chaotic attractors, nor the weather, nor the climate. The climate is not a random event. And yes, some asteroid could strike and send us all back to an ice age quicker than we might get there otherwise, but climate is not random. There are very specific real deterministic factors, acting over hundreds of thousands of years down to a few years, that affect climate. One of those is CO2 levels, and they’ve increased 40% since the 1700’s. This is rapid in geologic terms, and you’d expect some effect in a dynamic chaotic system like the climate. This graph of the radiative forcing of CO2 isn’t random, but simple physics, and just one of the variables (albeit perhaps the most important) that has affected the earth’s climate over the past few hundred years. We are all still waiting for your 25% skeptic side to show, but still 100% of your posts are from your 75% CAGW side. You are in cheerleader territory at this point. The following paper demonstrates that net and downwelling longwave radiation coincides with SST/ENSO events, it does not precede the warming of the oceans. Therefor the cause of warming oceans has to be found outside rising atmospheric CO2 levels. This fact is easy to mathematically calculate based on the ability of longwave radiation to heat oceans enough to bring an ocean area out of neutral to an El Nino event. LW radiation cannot do that in the time span observed between neutral and El Nino events, nor is there sufficient heat-making energy in LW to do that. The paper does show that net and downwelling longwave radiation are a good descriptor for El Nino events, as good as three month running averages of SST’s are. Therefore increasing levels of CO2’s ability to increase re-emittance of LW cannot be involved in warming the oceans to an El Nino event, but changes in downwelling and net LW coincides with the event and is probably an immediate EFFECT of an ENSO event. The case against CO2 warming the oceans is pretty tight. Other papers, past and present, demonstrate a clear and convincing correlation between SST and air temps/pressure gradients. Regarding the Arctic atmospheric systems then, it is still my position that the juxtaposition of oceanic pools and currents of warm and cool areas affecting atmospheric pressure gradients is the lion’s share of the cause of the atmospheric change over to what you refer to as the Arctic Dipole. You are left with determining what additional influence warmer/cooler air not already warmed/cooled by oceanic currents and pools has in bringing about a sustained or more frequent dipole. In making your case, my previous reference (IE Polyyakov) show that evidence strongly suggests that the dipole is not a new occurrence, nor a more frequent one, and shows no correlation whatsoever to increasing CO2. Gates and Julienne have not brought a convincing argument for CO2 influence on the Arctic Dipole. The mathematical mechanism for CO2 is not there. However, I might be willing to contemplate that land temps warmed by increasing CO2 may have a role when confronting a cooler air mass. However, land temps cool rapidly, regardless of what heats them during the day, when the Sun goes down, something the Arctic is rather well known for. For CO2 to be the driver for sustained, stronger, or more frequent dipoles, you must demonstrate it’s ability to keep the air heated 24/7, even when SST’s are changing back to neutral or cool events. I’ve listed my areas of skepticism (where’s the missing heat? for example), but the basic science of increased radiative forcing from increased CO2 I believe is pretty rock solid. Some have suggested that CO2 is purely a logarithmic effect, but chaos theory would preclude that assumption even if it looks good on paper. It seems a lot of time is spent by some skeptics talking politics, which interests me not in the least. In total, of the thousands of pages of research that I’ve read, it’s made me a (75%) believer in the overall AGW hypothesis, and the Arctic sea ice, in my estimation, is the best single place to put my interest in moving that percentage significantly one way or another. 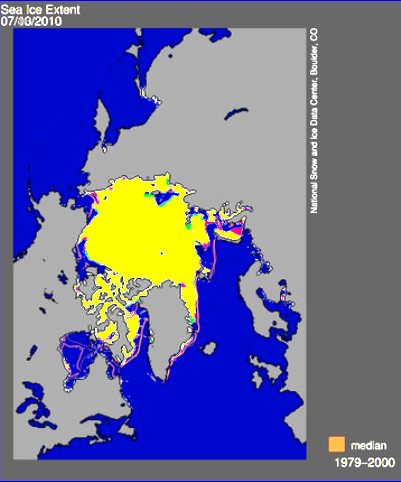 I don’t for example, happen to believe that the Arctic has been ice free in recorded human history. Yes, parts of Greenland were warmer during the MWP, but nothing that I find credible would indcate that one could sail across the Arctic at any time during recorded history without encountering ice. Could the current downtrend in Arctic Sea ice be from some natural variation, and not caused by the 40% increase in CO2 since the 1700’s. It is possible, of course, and, so I’ll gladly read any scientific study that could suggest some other reasonable natural forcing agent that could be warming the Arctic and melting both sea ice and permafrost in the ways we’ve seen the past decade or longer. Historic accounts are interesting, but hardly comprehensive, and leave me rather skeptical about their credibility for documenting the climate of the entire Arctic. It is this kind of skepticism that I have no time for. There’s real mysteries to figure out, and that to me is the fun of science, but spending time listening to recycled talking points from some skeptics who would know the first thing about how CO2 really behaves in the troposphere doesn’t interest me. Pamela, I never said the CO2 is responsible for the Arctic Dipole Anomaly. What I disagree with is your continued assumption that SSTs drive the Earth’s atmospheric circulation on both a global and regional scale and that nothing else matters. I suggest opening up any atmospheric text book to educate yourself on ALL the factors that control atmospheric circulation. A good book to start with is Meteorology Today by C. Donald Ahrens. It is an introduction to weather, climate and the environment and explains things on a level that any college student should be able to easily comprehend. I already showed you how an anomalous heating source, such as more open water in the Arctic Ocean influences atmospheric circulation within the Arctic and I’ve pointed you to references so that you can read the studies for yourself. I don’t understand your stubborn refusal to expand your mind. Thus, if there is a link between DLW radiation and ENSO, and there is a link to increased CO2 and increased DLW, then it stands to reason that there is some linkage between increased CO2 and ENSO events, though I would guess it is more complicated than it would first appear (i.e. because it is a dynamic chaotic system, it is certainly far from any linear type of relationship and probably involving multiple feedback loops, both positive and negative). Pamela, I never said the CO2 is responsible for the Arctic Dipole Anomaly. I just wanted a point of clarification on your point here. I also have never said that CO2 is responsible for the “existence” of the Arctic Dipole Anomaly, as it certainly exists a phenomenon separate from CO2 concentrations, but do you believe that the frequency or intensity of the DA might not be enhanced through general Arctic warming, (especially open water later in the season?) and to the extent that this warming is caused by increased CO2, then the DA’s frequency and intensity is related to increased CO2 concentrations? Perhaps you disagree with the direction that some research is going in this area, and that would be interesting in itself, or perhaps I’ve misunderstood the concept of polar amplication of general anthropogenic GW. Any clarification here would be helpful. I suggest opening up any atmospheric text book to educate yourself on ALL the factors that control atmospheric circulation. there will be changes in the vertical temperature structure of the atmosphere; (2) different regions will warm at different rates, changing horizontal temperature gradients. However, just what the changes will look like is still pretty much a wild card – different climate model sensitivity studies give a wide range of outcomes. In the Arctic, the recent large declines in the summer sea ice cover strongly warms the lower atmosphere in the cold season (especially autumn; we have already seen this happen). Arguably, this Arctic warming will reduce the basic temperature gradient from the equator to to pole, meaning that extratropical cyclones (the low pressure systems that accomplish much of the heat transport from low to high latitudes) will be fewer, less intense or both (with a smaller temperature gradient, there is less of a need to transport heat). However, there is no observational evidence that this is happening, and in fact there is some evidence for more frequent and intense autumn cyclones (I have a paper in press in Tellus about changes in autumn cyclones and their relationship to more open water in September). On a more regional scale, the recent warming that extends through a considerable depth in the lower troposphere decreases the atmospheric air density and raises the height of upper-air-constant-pressure levels over the Arctic Ocean, which weakens north-to-south pressure gradient that drives the west-to-east airflow in the upper troposphere. Some recent work by J. Overland shows a 40% reduction in the west wind component for October, November and December. Some studies have shown this then favors a negative AO state. But as to your question, will we see a more common Arctic Dipole Anomaly as greenhouse gas concentrations increase? The best answer based on our present knowledge is that we simply don’t know, but I would expect to see more atmospheric variability as we lose the stabilizing affect of the sea ice. Scott, I find your comment spurious, especially as some justification for why “people are becoming more sceptical of scientists.” This was a discussion about SST’s and their influence on global circulation and Julienne was making the valid point that all factors should be considered, not just SST’s. The additional adjective “known” is obviously implied in her comment, as you can’t consider what you don’t know, nor can you find it in textbooks. Any implication that there is any cause to be skeptical of scientists for trying to look at ALL factors (obviously known ones) is ludicrous…for that is what science is all about, and even more so, the most exciting thing about science is to be on the cutting edge where unknown factors are discovered and moved into the category of the known. Well then Julienne, since the test of your hypothesis resides in relatively short term weather pattern variations, we should soon know whether or not you are on the right track. Or are you supposing that we have not yet reached a tipping point and that the test of your hypothesis is somewhere yet in the future? And just so you understand my point, if you say that, I will dismiss your hypothesis straight away. So I find your hypothesis weak. Why? Because trade winds, El Nino, La Nina, the NAO, the AO, and other oscillations that have known and very strong affects on weather pattern variations, can beat CO2 warming all to heck and gone as far as the affects you list. Each and every one of the patterns you mention have natural causes already in place. How will you know which is the cause if your dipole continues to exist? Will you admit that if natural parameters are in place you still won’t know whether or not it is CO2 related? What do you consider to be the definitive tests of your hypothesis, since there are several I can think of right off the top of my head? By Ian Simmonds and Kevin Keay? We certainly know the term “anomalous” and the phrase “we simply don’t know” will apply to much that goes on in the Arctic for many years, and certainly as long as it is undergoing such rapid changes. An exciting time to be studying the cryosphere! After looking at harry readme you expect anyone to trust a CAGW scientists computer generated stuff???? The use of computer models instead of real life data is what skeptics are so upset about to begin with. That and hiding the decline and nature tricks and adjusting data arbitrarily and homogenization…. Recent increases in autumn cyclone associated precipitation (CAP) are clearly associated with a shift in atmospheric circulation, with the 2004-2008 pentad characterized by anomalous low pressure over the Barents Sea extending eastwards into the E. Siberian Sea. This is reflected in regional increases in cyclone frequency and cyclone intensity, as well as an Arctic-wide increase in column water vapor. The latter two changes are consistent with the tendency for higher precipitation efficiency of cyclones for most (not all) areas in which CAP has increased. The tendency towards regional increases in cyclone intensity is consistent with findings from Simmonds and Keay (2009). But, even though these results are consistent with physical reasoning and with expectations of 21st century changes from climate model simulations (e.g., in accord with Finnis et al. (2007) and other efforts, a greater precipitation efficiency of cyclones attends an increase in column water), I do not find a compelling reason to attribute them to reduced sea ice extent. The results may be more simply interpreted in terms of a circulation shift independent of any forcing by sea ice change. Note in this regard that while the most pronounced open water anomalies in September in recent years have been north of Alaska and eastern Siberia, in turn associated with strong positive autumn anomalies in sensible and latent heat fluxes as well as column water vapor, positive precipitation anomalies have actually been largest in the Greenland, Norwegian, Barents and Kara seas. Nevertheless, cause and effect cannot be separated from a purely observational perspective; the possibility that altered sea ice cover has in fact forced part of the observed circulation change should not be dismissed. It is notable in this regard that at least two recent observational studies besides Simmonds and Keay (2009) cite evidence of circulation anomalies following Septembers with low ice extent (Francis et al., 2009; Overland and Wang, 2010). .
Another issue is that apart from a general increase in high latitude precipitation, there is limited agreement between existing modeling studies as to the changes in circulation, cyclone frequency, intensity and cyclone associated precipitation that can be expected in a warmed world, let alone signals linked to attendant changes in sea ice. An effective comparison between observed and expected change will require a coordinated set of simulations with different models each adopting the same experimental design. Julienne, now we are in a agreement. Nice conclusion. Make sure the spread of models include several that do not consider CO2 factors. Polyakov would be a good source for those models. If several different forcings and feedbacks, both natural and anthropogenic, cause the same outcome, you will still be at a null hypothesis and must fall back on natural variation. I am going to wade in here. After my knock-down, drag-out fight with Willis about CO2 measurements, for the sake of this argument let’s say that he was right, and accept the premise that CO2 has been accurately measured since the 1950s and is uniformly distributed throughout the atmosphere. If CO2 is uniformly distributed then the effect of CO2 is also uniformly distributed. Since air circulation is caused in part by temperature gradients and the resulting pressure differentials (and not by the absolute temperature) the net effect of CO2 on air circulation is thus zero. If on the other hand Willis was incorrect and I was correct, then CO2 is not uniformly distributed and the nice neat curve put out by Mauna Loa Observatory and the others is a farce, Ernest Beck’s collection of historic CO2 measurements varying from 250 to 500ppm was correct, and CO2 varies all over the place. Even then if we are talking a doubling of CO2 causing a localized increase in temperature of 0.6C, this is hardly a drop in the bucket when compared to the increase in temperature from 60F to 90F I saw in four hours this morning from the sun’s insolation. Oh, and if CO2 is such a big player, how come we tend to see more thunderstorms building in the afternoon after the sun has caused a rapid temperature increase, instead of at night when photosynthesis has stopped and plants are actually releasing CO2 instead of absorbing it. Sorry you can not have it both ways. Either CO2 is uniform (giving the possibility of accurate global measurement) or else it varies greatly across the earth’s surface and over short time intervals, making an accurate global measurement extremely difficult, and making all historic global data (except for satellite data) useless. Mathematically, chaos refers to a very specific kind of unpredictability: deterministic behaviour that is very sensitive to its initial conditions. In other words, infinitesimal variations in initial conditions for a chaotic dynamic system lead to large variations in behaviour. Minuscule variations in initial conditions can lead to large divergences in results, however perfectly identical initial conditions will always yield identical results. Chaotic systems are deterministic systems and are completely predictable. The chaos, as the term is widely used outside of mathematics, is illusionary. Besides, they take measurements at many more places than Mauna Loa. Do you understand what the word teleconnections means? Do you understand that everything on the planet is connected? CO2 is a known gas that traps infrared radiation. CO2 has increased due to human activity and will continue to do so. The idea that human activities do not have an impact on the planet (not to mention how we’ve completely altered the land-cover of this planet, the climatic impact of which is not insignificant), is arrogant and dangerous. I for one am glad there are people on this planet who do understand and who do care to preserve this amazing place we live in. Gail, have you forgotten that global warming is not global? Have you missed the part where warming in larger in the Arctic than at the equator? Do you understand that it’s the sun that is the primary input to the climate system and that the fact that the equator receives more solar input than the poles is what drives the Earth’s atmospheric and oceanic circulation? Change the equator to poles temperature gradient and you change atmospheric and oceanic circulation. It’s basic physics. No CO2 induced warming is going to be uniform because of all the feedbacks in the climate system. Gail, have you forgotten that global warming is not global? Really? So if CO2 concentrations shot up past 600 ppm and the (C)AGW models were amazingly verified by sharply rising temperatures, the increases would not be everywhere worldwide, some places would actually get colder? Wow, that (C)AGW stuff sounds truly wonderful! So since global warming is not global, which places will get colder? They sound like good places to build resorts for people wanting to escape the heat! Oh wait, are you saying not that some places will get colder, but rather some will see no changes in their average temperatures? So some select spots will not be affected at all by global warming, no matter how warm it gets elsewhere, at least temperature-wise? And where are those places? Imagine the far-flung future of the (C)AGW modelers, where so much of the Earth is roasting with 10°C average increases since pre-industrial times, and some places haven’t gone up at all! CO2 is a known gas that traps infrared radiation. Yes, CO2 has been identified, way back around 1630 by Flemish scientist Jan Baptista van Helmont, thus it is a known gas. In that you are correct. CO2 absorbs and then radiates infrared, but only a few wavelengths, and in the atmosphere it only radiates about 50% of the time in a direction that could be said to be inward to the Earth rather than outward to space. If I designed a device that would catch mice, but only a few select sizes, and half the time it would let them go unmolested, do you think I’d be successful selling it as a mouse trap? Do you work in advertising? CO2 has increased due to human activity and will continue to do so. Excellent point! The increase is ongoing, will not stop, thus adaptation to whatever effects result from increased CO2 levels is the logical thing to do. The idea that human activities do not have an impact on the planet (not to mention how we’ve completely altered the land-cover of this planet, the climatic impact of which is not insignificant), is arrogant and dangerous. Exactly! Just look at how mankind has completely altered the land-cover of Death Valley, it used to look so much different before mankind mucked around with it. And then there’s Antarctica. Have you seen the tremendous land-cover changes man has wrought in Antarctica? Shameful! I for one am glad there are people on this planet who do understand and who do care to preserve this amazing place we live in. Indeed, and here on WUWT you will find a truly impressive collection of individuals who care deeply for the environment and work hard to preserve and even improve it. Why, I myself use both the curly fluorescent light bulbs and the canvas shopping bags! I am growing my own vegetables right now! Thank you for that. ” Have you missed the part where warming in larger in the Arctic than at the equator? You just proved my point. CO2 induced warming is not driving the climate. Summer temps are the ones that will effect ice melt in the Arctic the most since you do not melt ice in the autumn and winter when the snow is falling and the sea Ice is freezing. Yes, that Five-Day Average for a plot-prediction is a good point. Ug. Not “Beck’s collection of historic CO2 measurements” again! But even Beck had those measurements at Mauna Loa in his graph as the average global concentration from the 1950s…. I am not arguing the Beck collection of historic measurements. I am pointing out that either CO2 is uniformly distributed in the atmosphere or CO2 is not uniformly distributed. You must choose one or the other assumption; you cannot have it both ways. Let’s look at how Mauna Loa measurements are done. The assumption is CO2 is uniformly distributed in the atmosphere This is actually stated and the assumption is used as a reason to toss out data that does not meet that assumption. “4. In keeping with the requirement that CO2 in background air should be steady, we apply a general “outlier rejection” step, in which we fit a curve to the preliminary daily means for each day calculated from the hours surviving step 1 and 2, and not including times with upslope winds. All hourly averages that are further than two standard deviations, calculated for every day, away from the fitted curve (“outliers”) are rejected. This step is iterated until no more rejections occur. As a lab manager I have fired over a dozen degreed chemists for that type of thinking. I caught them, for example, retesting a sample until they could finally make it supply a desired result. They recorded only the “good” result and tossed out the rest. You DO NOT throw out data! It is bad science to throw out data. Omission of data points must be for scientifically validated reasons. For example, if the wiring to a sensor is loose, and the resulting signal is noisy, it is proper to mark that particular data as invalid, and to ignore it. However, the history of atmospheric CO2 measurements tends to involve throwing out data that spoils the neat picture desired by politicians and propaganda mongers. Scott, I find your comment spurious, especially as some justification for why “people are becoming more sceptical of scientists.” This was a discussion about SST’s and their influence on global circulation and Julienne was making the valid point that all factors should be considered, not just SST’s. The additional adjective “known” is obviously implied in her comment, as you can’t consider what you don’t know, nor can you find it in textbooks. I don’t know what definition of spurious you’re using here, so I’ll assume you’re just saying it’s a false premise, and with that, I couldn’t disagree more. A very big part of the increased scepticism of science in recent years is the scientists’ overconfidence and claims of being absolutely certain of something or understanding something completely. And no, “known” is definitely not implied in Julienne’s comment. Perhaps if she hadn’t CAPITALIZED the word “ALL”, then maybe I’d buy that, but the tone implied by the capitalization takes away that argument in my book. Any implication that there is any cause to be skeptical of scientists for trying to look at ALL factors (obviously known ones) is ludicrous…for that is what science is all about, and even more so, the most exciting thing about science is to be on the cutting edge where unknown factors are discovered and moved into the category of the known. These sentences here make it clear that you didn’t properly interpret my first comment. I should have been more clear. I did not mean people should be sceptical of scientists for searching for/looking at all the factors, but for claiming they know all the factors involved in something (or worse, that all those factors are in a textbook). Huge difference there, and I would think that the majority of sceptics here at WUWT think that climate scientists focus too much on CO2 causing warming and not looking at other sources (both natural and anthropogenic). Is that not Dr. Pielke, Sr.’s viewpoint as well? Well i am no expert like you, but my gut (which I trust in complex situations) says that the ice extent for this year will be least on record, less than 2007.